The FSCS has admitted to the building society sector that a review is needed into the compensation scheme levies imposed on financial bodies. Speaking at this year’s Building Societies Association conference in Yorkshire, FSCS chief executive Loretta Minghella admitted that there were inequalities with regard to the levies imposed on institutions. Building societies have heavily criticised the FSCS for imposing significant levies on the sector in the wake of the recent bank crashes in the UK and in Iceland as they sit in the top ‘deposit taking’ class of the FSCS. Minghella said: “Lord Turner said at a recent Treasury Select Committee that the FSA will be looking again at how the FSCS will be funded in the future, but it may disappoint you to know that I cannot announce any change to the system today. The FSCS expects to work closely with the FSA in a review of levy classes. Minghella said the FSCS and the FSA is considering whether a pre-funded FSCS would be a better method of compensation funding or whether the levies should be weighted on risk adjustment rather than risk-based principles. The UK platform market has a higher potential for growth than the more established Australian market, even in the current market conditions, according to new entrant Macquarie. Skandia has launched an enhanced dividend seeker product which will offer income based on the dividend payments of the FTSE 100 companies, rather than their share price valuations. Legal & General has struck a partnership with Knight Frank to distribute its protection products. Guide: 10 required letters — what to send, to whom and when? 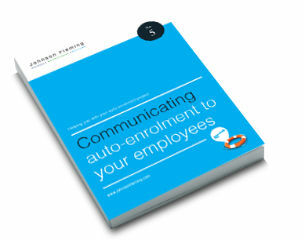 This guide from Johnson Fleming will take you through the required communication and also give ideas for additional actions that will ensure your auto-enrolment project is a success. The topics in this guide include: the letters you need to send out; what to send and when; the importance of employee engagement; and what to consider as additional communication.